East Bay Eats: Holy New Whole Foods! What would Batman and Robin think? 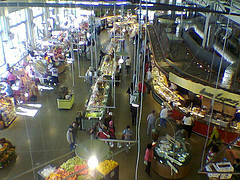 With its chic industrial/gothic design, the new “market hall” style Whole Foods that opened recently near Lake Merritt in Oakland certainly could be used for a set on the next Batman flick. We wish we’d known about the opening day festivities, what with an appearance by Paul Bartoli, and free reusable shopping bags to the first 5,000 customers, we would have stood in line. As it was, we made it to the store about 10 days after the September 26 shindig. Well said. Although the circular layout could also potentially make us a little stir crazy. As it was, we got dizzy on our first few visits. On one occasion, we were halfway around before realizing we needed a hand-basket, and had to backtrack all the way round to the start to retrieve one. The main focus of the store seems to be ready-to-eat. There’s so much prepared and ready to be prepared food -- giant steam tables, a pizza and salad and smoothie bar, a Japanese food bar, the much-touted Bistro where we have yet to try the steak frites. Somehow we can’t quite picture either sitting down inside the store to eat such a dish, nor schlepping it home for take out as it seems a shame for such lovely fresh fare to sit and sweat in a box, as compared to the pre-made items which have been sweating a bit already. Tales Of Mere Existence "HOW I FOUND OUT ABOUT GIRLS"
Which site do you prefer? O.K., stay dry!